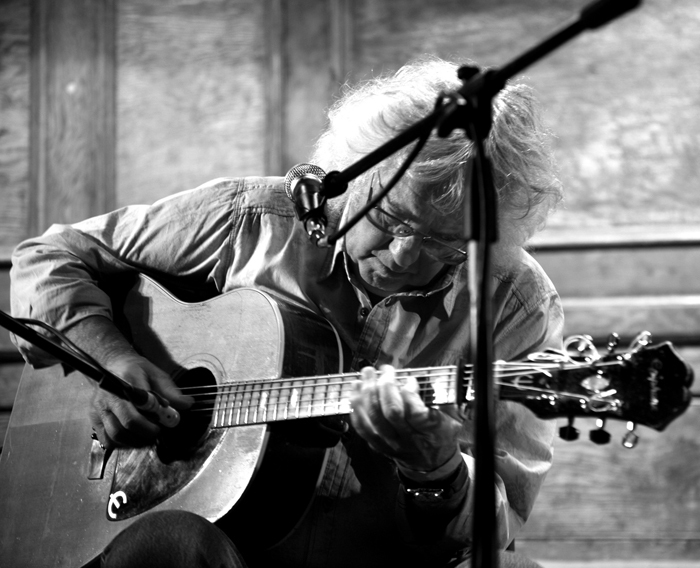 Originally inspired by seeing Big Bill Broonzy and Ramblin’ Jack Elliot, WIZZ JONES learned his guitar licks from the likes of Davy Graham and Long John Baldry while playing in the coffee bars of London’s Soho in the late 1950s. In the 1960s, he followed the time-honoured buskers’ trail from the streets of Paris to the markets of Marrakech, returning to Britain with a unique acoustic guitar style, an eclectic repertoire and a “right hand worthy of Broonzy”. Clapton, Keith Richards and the late John Renbourn have all named him as an important early influence and Bruce Springsteen opened his Berlin concert in May 2012 with Wizz’s song “When I Leave Berlin”. After more than fifty years on the road, Wizz continues to tour on the acoustic folk and blues circuit. Wizz will be joined tonight by his son, Simeon on flute, sax and harmonica.